Your big day is quickly approaching. You’ll walk down the aisle and say I do, but then what? How will you spend your honeymoon? While most couples choose exotic vacations to tropical islands with relaxing days on the beach, some like to think outside of the box. Giving back is a great way to spend time as a couple! Many of us lead very privileged lives. We have nice homes and great friends. How often do we take the time to just reflect on the world around us? While you could spend your honeymoon lounging by the pool (and there’s nothing wrong with that! ), sometimes you crave something a little more outside of the box! Keep reading to explore how to spend your honeymoon a little differently! One of the most unique ways to spend your honeymoon is volunteering abroad! Not only is volunteering abroad an amazing way to give back to those less fortunate and benefit a great cause, but it’s a unique way to see the world. Experience new places through the eyes of locals, and speak to people from different walks of life! You can volunteer abroad in all reaches of the globe. No matter your skills, you have value as a global volunteer. It’s easy to get caught in the materialism of your wedding day. From choosing the right flowers to the expensive venue, the focus becomes more about the aesthetic of your wedding than about the love you share as a couple. Bring the focus back to what matters most by planning a volunteer abroad honeymoon together! Not sure where to start? You’ve come to the right place! Here are some of our favorite volunteer abroad opportunities that are perfect for you and your special someone! After the big day, you’ll probably want to unplug from it all! Immerse yourself in the relaxing atmosphere of an Eco Village in the heart of Granada, Colombia. At Varsana Eco Village, you’ll learn all about organic farming, eco-building, sustainable tourism, and the art of yoga! Work a few hours a day in exchange for the relaxation of a lifetime, complete with hiking, daily yoga, philosophy class, and more. Explore an area of the world rarely seen by westerners at the Sadhana Forest with this local non-profit located in the village of Auroville. This non-profit is actively trying to recreate the tropical dry evergreen forest indigenous to the area and only found in this part of India and Sri Lanka. Help with conservation efforts while living in this eco-community! Enjoy the beautiful scenery, daily workshops, and a community of world travelers. Are you unsure if you can commit to an entire honeymoon spent volunteering? Any effort is a big effort! Spend a few days volunteering at your favorite location and spend the remaining time traveling and seeing the region! Volunteering abroad as a couple is also a great way to keep costs low when honeymooning since many non-profit organizations allow free or greatly reduced accommodation in exchange for volunteering. Have you already booked your honeymoon destination? You still can do something different with your wedding registry! Give back by raising funds for your favorite charities instead of collecting traditional wedding gifts. For example, you can raise funds to help build a hatchery for baby sea turtles in Costa Rica or even a volunteer house for a non-profit organization in Africa. Give yourself the gift of kindness! Another unique way to spend your honeymoon is road tripping! We so often focus on exploring the world far away from our home that we forget so much excitement is in our own backyard! Road trip around your home state or even across the country to take in the unique sites from quirky to spectacular. Want to take your road trip to the next level? Rent an RV to travel in style! Plan your trip start to finish to unplug and let the road take you where it wants to go! 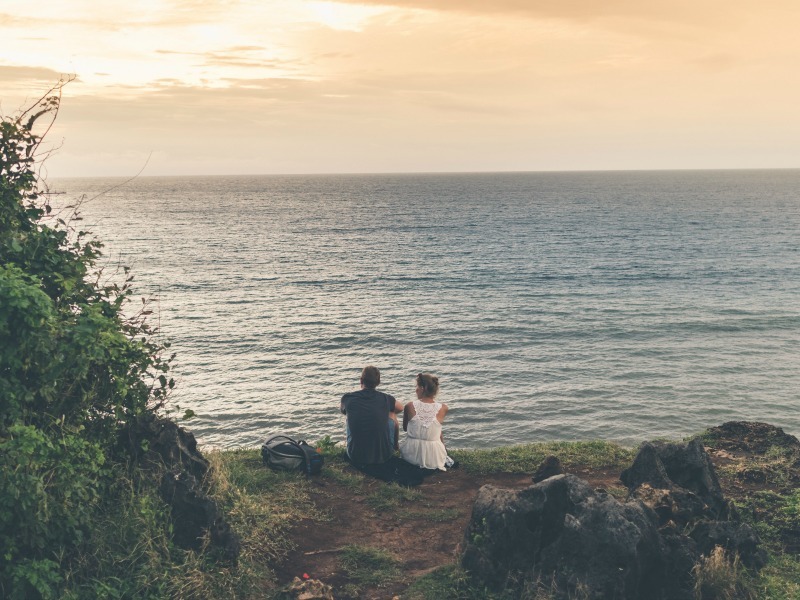 Create a honeymoon road trip you’ll both never forget! Document your favorite stops to create a truly remarkable wedding album! Did you blow your honeymoon budget on your wedding? That doesn’t mean you can’t still have a spectacular honeymoon! Who said you had to travel far to create memories as a couple? Enjoy your new life together in your own hometown! A staycation is a great way to see your current city in a night light. Though you live in your own town, you probably don’t see much of what it has to offer. Book a stay in a downtown hotel or rent an apartment on Airbnb. Eat at the best local restaurants your city has to offer and take in the sights! You might discover your town is bigger and better than you thought! Instead of being a tourist during your honeymoon, be a traveler whether you’re seeing the world of your hometown. Experience something new with your partner and bond through shared experiences. There’s more to life than the big wedding. Make the most of the budget you have! Whether you stay locally or travel far, you can still have an amazing experience that you’ll both look back on with fond memories. It’s okay if your honeymoon doesn’t look the same as your friends or as celebrities on TV. Doing what you love is what makes it special! Written by: Wendy Dessler, a super-connector who helps businesses find their audience online through outreach, partnerships, and networking. She frequently writes about the latest advancements in digital marketing and focuses her efforts on developing customized blogger outreach plans depending on the industry and competition.